Hello from LifExchange. I am Shari – owner, operator, marketer and inspired entrepreneur. I am my business. I love to travel and it has changed my life! The more I think about my new blog series that I have decided to title “I am my business,” the more I begin to realize just how many memories and experiences have shaped who I am. My first lesson learned is a common saying, never take life too seriously. I thought this was a good topic to begin the New Year. The first time I tested this lesson while traveling for work was in 2006 – I was headed to Almaty, , then Istanbul, and on to Ankara in Turkey from NY with layovers in Frankfurt (twice) and Vienna. This was my first international business trip with my new job and it was not like anything I could have imagined. After 16+ hours of travel I arrived in Almaty after midnight (not looking or smelling all too pretty). I was greeted at customs by daunting men and women with guns. With some hindsight that is not so uncommon these days but after two layovers, the flight did not end with a warm fuzzy welcome as we were ushered through a long and chaotic customs line. I was with a client (and now friend) named Ashley. Making sure I looked like I was in control, I directed Ashley through customs and we were met by one of our hosts outside of baggage claim with a sign. At a little past 1:00 a.m. we arrived in what looked like a 3 star hotel where my new boss, James, greeted us and helped check us into our rooms. This is where it all began…. Ashley heads to her room and James says to drop off my bags and meet him and our other clients in the hotel bar for a nightcap. Picture this – I walk into my room and my first thought is “What did I sign-up for?” There is a hole in the ceiling above the bed. Okay, it is a new country; I have to be open to my living conditions. As I lay my bags down I go to use the bathroom. I turn to wash my hands but there is no sink. I feel dirty, grimy and tired and just want to clean up. Do you know the feeling? As I circle the bathroom in a perplexed state, I spot it. The sorta-kinda dish that is used as a sink to catch water is in what looks like a shower. Alright, I am only here three days, I can make this work. I walk back into the main bedroom and reach for a sweater, it is a bit drafty and I am cold. Maybe if I can close my balcony’s sliding glass door all the way I can get rid of this chill….that was my thought as the screen door came crashing down on me, falling into the room. Not even knowing what to do and with no English speaker at the front desk I head to the bar to see my boss. I found James and said there may be a few problems in my room and I do not know how to request a change. His first thought (which he shared with me years later) was that he had a Prima Donna, a princess as a new employee; what had he gotten himself into? He generously appeased me and came to the room. One look at his face and I knew I was not crazy…this was no three-star room. My paint chipped, mold-smelling room with screen door issues was declared unfit. We retrieved my bags and headed back to the front desk where James found someone to get me a new room. (I learned later I was on one of the few floors not yet remodeled.) Now heading upstairs again, I begin to relax. I think to myself, drop off the bag and go meet my travel companions. If only it were that easy…. I turn the key and search for a switch to turn on the light. I struggle inside, find a lamp and turn it on but the lamp is not the only item there…I also find a foreign elderly woman at least 65+, in bed with no covers, naked, who looks up at me startled. As I back away and apologize she starts to scream, yell, and chase me. This woman knows no English and she begins to follow me (yes, still naked) out of the room screaming, angry and probably a little afraid. Which is funnier – the nice old women who will tell her friends she was woken from her sleep by the crazy American breaking into her room, or my running down the hall dragging a suitcase, back pack and coat screaming apologies to a naked women who cannot understand me? As I made my way to the elevator, I did not go to the front desk, I did not inform anyone. I mean let’s face it: someone was going to be searching for a young American woman breaking into hotel rooms sooner or later so I might as well head to the bar and meet everyone else. It is now 3:00 a.m. and I walk into the bar. Let’s be clear, by “bar” I mean small cafeteria-looking square room with a few fake wood tables and a counter to order drinks. I sit down as my colleagues look at me. “Don’t ask” I say, then I order a glass of house red wine. * As I finish my glass of wine, the hotel front desk worker finally came running into the bar looking for me. I won’t drag this out but after that I was upgraded to a nice room that was 5 x 10 with a twin bed no springs and an actual sink. Now for a little rest before my big day, we had a presentation for over 300 university students at 8:30am the next morning and then 8+ hours of interviews to follow. I could have dwelled on the awful hotel, the bad service, the fact that a “western” marketed hotel had no English speakers and that I only had 3 hours of sleep before my first 16-hour work day – but I didn’t. I could have let the late night bleed into my trip – but I didn’t. Instead, I remember drinking and laughing with my new boss over the naked lady running down the hall in Kazakhstan, and I remember the amazing international students I met and hired to come spend the summer in the U.S. I remember the beginning of a lifelong and treasured friendship with Ashley. I remember eating amazing new foods such as beshparmak and shawarma. I went Ice Skating at Medeu (see below for information). Medeu was the most beautiful outdoor Ice Skating rink I have ever visited. It was peaceful, it was grand, and with the crowd of families and young couples it was playful, too. This may have only been the first 24 hours of my trip, but it was also the first 24 hours of my new life. My passion for people and travel, new sights, and new tastes began in these first hours and started the many adventures that shaped who I am. Watch for my next “I am my business” blog to learn more about my journies and the lessons I have learned. On this first trip I learned the importance of never taking life too seriously. I have been surprised as I reflect on my memories with laughter and continued to learn from my experiences. * While in Almaty I had one of the best wines I have ever tasted. I do not remember the vineyard (so I know I am no help) but it was a Georgian Wine. On a side note we did have time before flying to Turkey to visit Medeu. 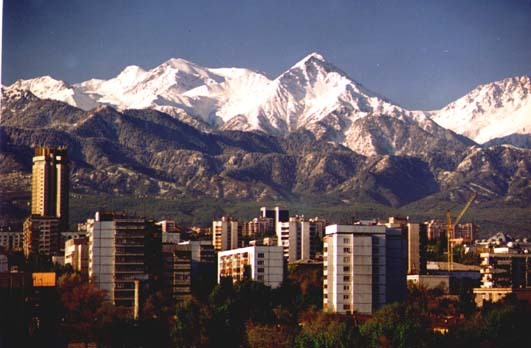 A must visit if you ever find yourself in Almaty. The ice skating rink Medeu is located 1,691.2 meters above sea level making it the highest rink in the world. This world-known sports complex was erected in 1972. The ice surface occupies 10.5 thousand sq.m., which allows to conduct contests in skating sport, hockey and figure skating. Before this rink was updated in 2011 for the Asian Olympics you could skate around and have beer and cigarette venders sell you drinks while you skated.